I am happy to share that our work on climate change and mental health has been featured in a special issue of International Innovation: Disseminating Science, Research, and Technology on Catalysts for Care (Issue 185). International Innovation is an open-access publication that features interviews, research, and content from around the world on leading scientific and research breakthroughs, discoveries, and thought. Our team was humbled and honoured to have our work appear in this publication. 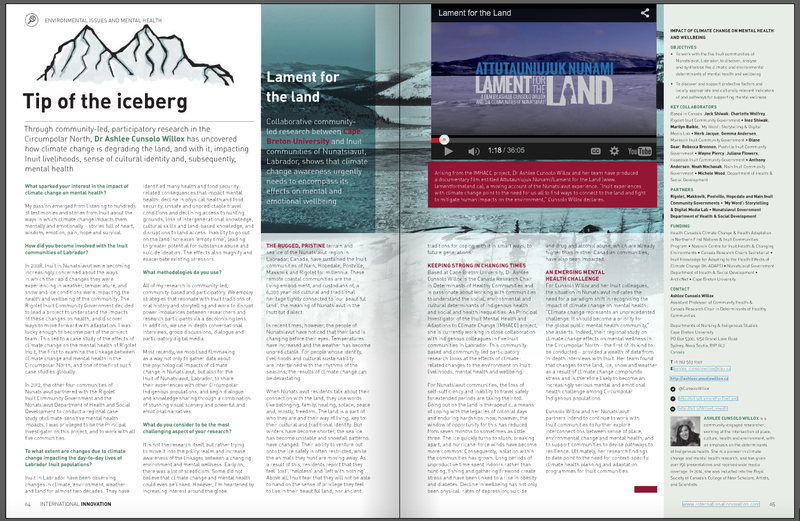 A screen shot is available below, but to view the digital version, complete with an embedded link to our documentary film, Attutauniujuk Nunami/Lament for the Land, please view pages 66 and 67 here.